The Kingdom Hearts TCG is a two-player card battle game set in the universe of Kingdom Hearts. Players travel through strange and wondrous worlds clashing with the Dark forces in order to win, all the while trying to stop their opponents from doing the same. Each booster pack contains 10 random trading cards! Booster Pack Odds: 10 Cards in Every Pack; Collect 22 Common Cards (6:1), 21 Uncommon Cards (3:1), 21 Rare Cards (1:1), 27 Super Rare Cards (1:3). 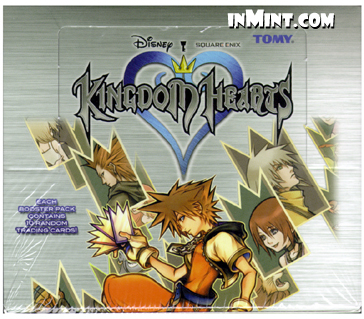 Each pack contains a random assortment of 10 Kingdom Hearts Trading Card Game Booster Cards. Each Pack Contains 10 cards (6 Common, 3 Uncommon and 1 Rare). 1 in 3 packs contain a Super-Rare foil card, replacing 1 Uncommon card.